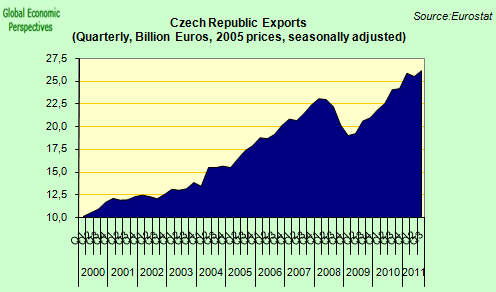 The Czech Republic is the first economy in central and eastern Europe to slide back into a full technical recession during the current downturn (evidently it is unlikely to be the last), with a 0.3 per cent quarter-on-quarter GDP decline in the last three months of 2011, after a 0.1 per cent drop in the previous quarter. The news, announced last Wednesday, is interesting but not entirely unexpected given the export dependence of the country’s economy, and in particular on exports to the eurozone, which also saw a GDP contraction in the fourth quarter. Still, it is curious that the country which arguably has one of the strongest in the region was the first to slide back into contraction. The country has a strong and competitive export sector, which normally drives growth forward. The problem with export driven economies is that once external demand (in this case mainly from German industry) weakens, domestic demand is not strong enough to maintain the growth dynamic.Thus such economies are inherently unstable. Unfortunately this is a pattern we are going to see more and more of now that domestic demand is only a real driver in relatively few EU economies (Poland, France, possibly Sweden). 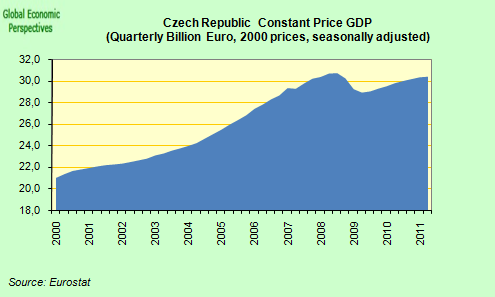 Even after the relatively bounce-back, Czech GDP was still below the pre-crisis peak in the second quarter of 2011, before it fell into recession again. 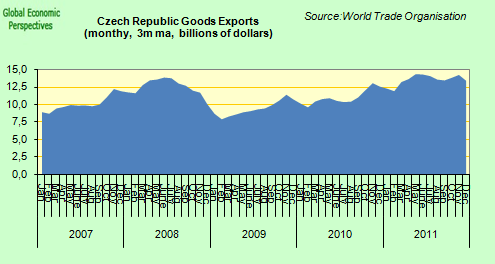 Exports as can be seen from the chart below really surged during the first phases of the recovery, but since mid 2011 they have effectively been stagnating (second chart showing 3 month averages). 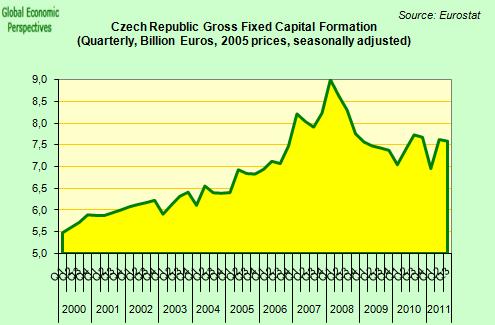 Fixed capital investment and construction activity, on the other hand, have fallen back substantially since the crisis, and look unlikely to recover in the short term. 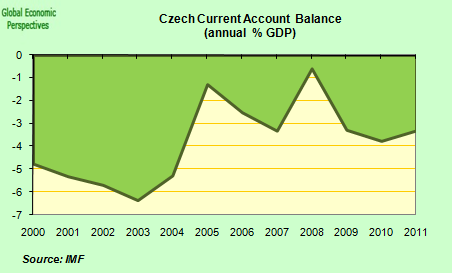 Another interesting detail about the Czech economy is the fact that although the country runs a very healthy trade surplus, strong negative income flows on the current account means that the country actually runs a current account deficit. The reason for the deficit is interesting I think, since the whole external account only balances due to strong FDI and equity inflows plus reinvested earnings. 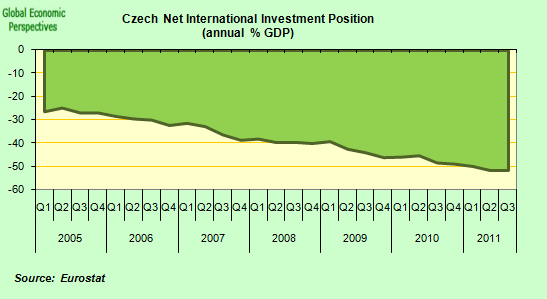 What this means is that the net international investment is deteriorating, and the day earnings are not retained and reinvested, that day the country will start to have a problem.It seems to me that this kind of model, and especially for a country with an ageing population and weak domestic demand is not sustainable, one-way inbound FDI is not a development model for a mature economy. 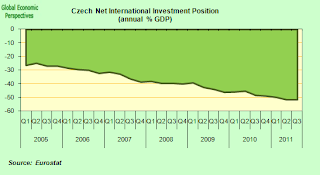 Czechs need to save, and then invest elsewhere to generate income to help support their pensions and health system. This is the whole problem with ageing societies in the east of Europe, the low levels of accumulated savings they inherited due to their earlier history makes them very vulnerable. In addition, the country is steadily accumulating a stock of sovereign debt as the need for a fiscal deficit has been created to support demand. 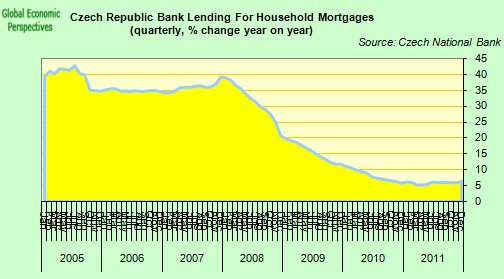 Accumulated debt is still low, but it has grown sharply since the crisis, and remains on an upward path. 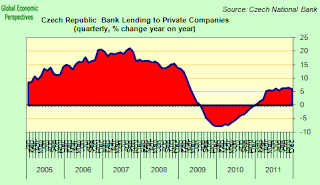 The deficit was around 4% of GDP in 2011, and looks set to stay at the same level this year. More importantly the deficit is in danger of becoming structural (that is to say inbuilt into the country’s economic growth) and may be hard to eradicate without a serious fiscal effort and a period of significantly under par growth. 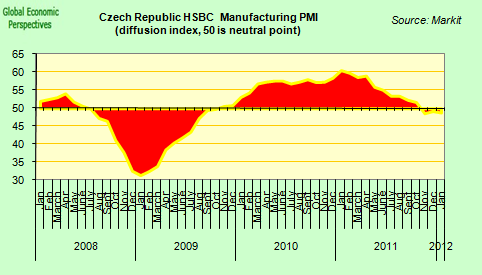 The Czech Republic has its own currency (the Koruna) whose value tends to fluctuate in accordance with global risk sentiment (rather than for any local fundamentals) and has rebounded sharply (despite the fact that central bank interest rates have been held at 0.75% for many months now) as risk sentiment has risen following the 3 year ECB LTRO development. 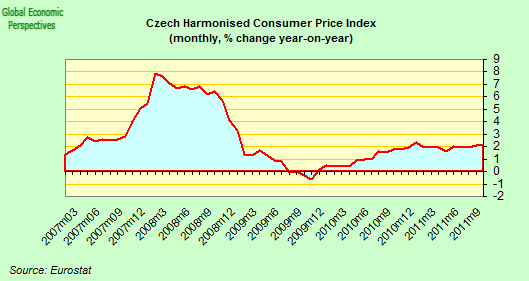 Despite the very low interest rates, inflation is well under control. In December the EU HICP was running at an annual 2.8%. Credit has slowed, but it is hard to tell whether this is not more the result of slow ongoing domestic delaveraging rather than any real shortage of funds to lend. Certainly there is no sign of a Baltic style credit crunch. 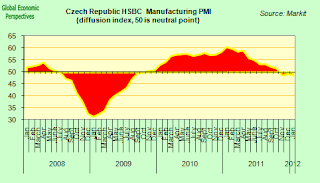 Looking at the manufacturing PMI, the industrial sector has been stabilising along with the rest of the EU, and the rate of contraction both in output and new orders is slow, so the economy should continue to stagger forward OK although there are few signs of an outright recovery, which will need to await a significant upturn in the Euro Area. Obviously one of the key nagging questions is why the country is so export dependent. 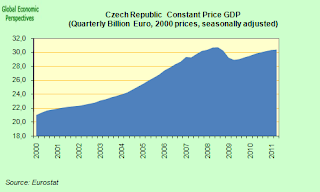 I have correlated this phenomenon with rising median population ages (like in Germany or Japan – in fact the Czech Republic looks awfully like Japan without the current account surplus) since the Czech Republic (along with Slovenia) has one of the oldest populations in Eastern Europe. Others explain the phenomenon culturally – the Czech’s are a nation of savers, unlike the Estonians whose reckless spending lead them into a housing boom/bust (do note the irony, please). Sylvie Pekarova, a 33-year-old pharmaceutical researcher in Prague, has no debt. She doesnâ€™t even own a credit card. 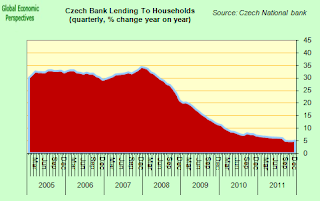 Consumers like Pekarova have helped the Czech Republic avoid the fate of the euro region, which is grappling with a debt crisis now into its third year. With private borrowing at half the euro regionâ€™s average, the country now boasts interest rates that are lower than 10 of the currency-blocâ€™s 17 members. 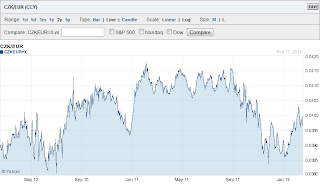 Thatâ€™s helping the governmentâ€™s drive to sell benchmark Eurobonds, which started this week. So anyway, you can take your pick according to the model which takes your fancy. But I do wonder about the relative predictive power for investors of models which use cultural biases and those which simply take ageing populations. Which societies among the African underdeveloped economies will be the big new savers of the future, and which will be the spendthrift bankrupts? Median age analysis at least has the advantage that it makes prediction reasonably easly – Spain, for example, is about to become a nation of savers – but I wonder how those who use cultural analysis go about identifying the unexpected new savers we will see come 2020? 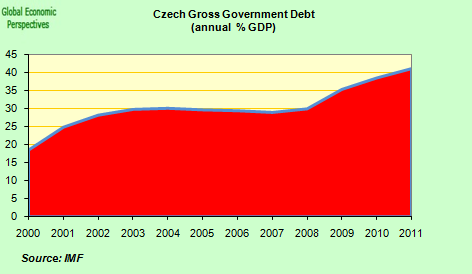 Isn’t domestic demand in Poland and France propped up by their governments running huge budget deficits? How sustainable is their growth? 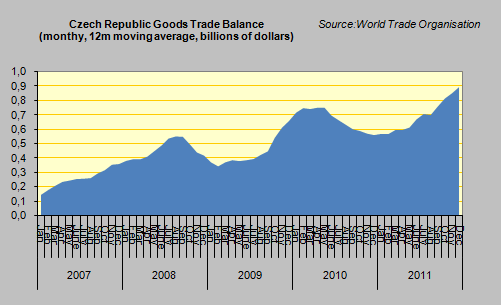 The Polish economy probably grew 4% in 2011 but they had a deficit of 5,5% of GDP. The swedish economy grew 4,5 % and they had a surplus. I am also looking forward to your analysis of the Baltic states. After 1,5 year of strong growth both Estonia’s (- 0,8%) and Lithuania’s (-0,9%) GDP contracted quite sharply in the fourth quarter compared with the third. Hi Jan, yes it is true that France and Poland run large budget deficits. In the Polish case there seems to be very little justification for this, and they will soon run into their own – self imposed – debt limit law. But the Czech Republic ran a 4% deficit, and got virtually no domestic demand growth, Spain ran an 8% deficit and got none, need I go on? France and Poland still seem able to get some bang from their domestic buck from stimulus spending – everyone else, from the US to Germany, seems to rely on the money arriving in China or Brazil to generate demand for products there. Well, in the US case I am exaggerating, but then they are still running a double figure deficit, and only getting around 2% consumer demand growth. Not good value for money. “I am also looking forward to your analysis of the Baltic states. After 1,5 year of strong growth both Estoniaâ€™s (- 0,8%) and Lithuaniaâ€™s (-0,9%) GDP contracted quite sharply in the fourth quarter compared with the third”. Me too. I’m on it at the moment. The Baltic debate is evidently far from over. Could you flesh this out a bit? 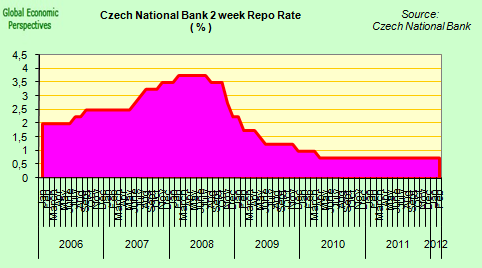 Is this effect driven by the foreign ownership of the bank system or is that too small to matter (or is it something else entirely)? “But the Czech Republic ran a 4% deficit, and got virtually no domestic demand growth, Spain ran an 8% deficit and got none, need I go on?”. Spain ran an 8% deficit but the relevant indicator here is a very sharp drop in tax revenue. 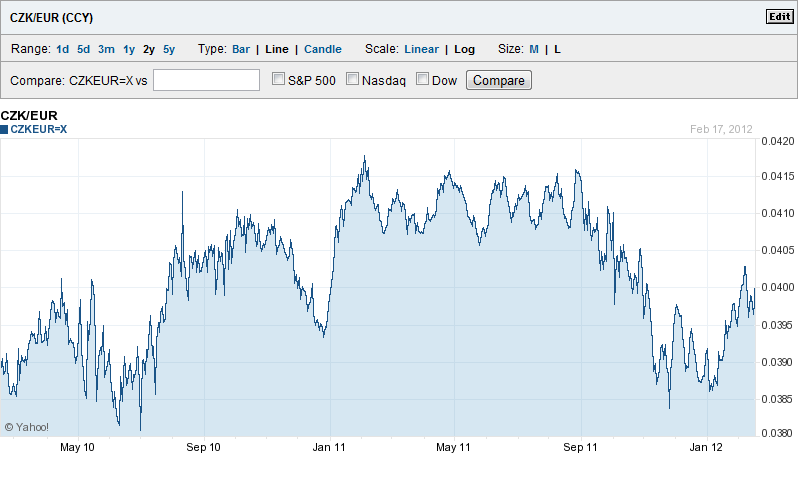 I do not consider the mere deficit a good indicator of demand growth. But Carlos, one of the main reasons revenue fell was that VAT receipts were down because people weren’t buying. Also unemployment was up for the same reason, and income tax and company profits also fell because people weren’t selling. In the end it’s all about demand. Well, it’s partly about the banks, but there would also be telephone and other utility companies, and then car firms etc. The thing is, FDI is a strong positive in a developing economy, but in a mature economy it needs to be a two way story (look at China now starting to invest externally), otherwise what you create is financial dependence, and later you have problems. The problem for most of the countries in the east is that they have not accumulated enough wealth to set up this two way flow. Well, Jan, I don’t disagree that it is hard to see why Poland has been running such a deficit. But I wouldn’t consider an 8% deficit a mere automatic stabiliser. It is a warning bell that something more serious is going wrong (in the US and the UK too) and that something needs to be addressed, or there will be more problems. I totally agree on that, fundamentals are very bad. What I wanted to say is that, given how messed up their economy is, such a deficit is not a surprise (but still very problematic of course), while the Polish one surprises me. Incidentally Jan, I’m just looking through the latest round of EU growth forecasts, and stumbling on the following on Poland in Bloomberg. I couldn’t help but think of you. 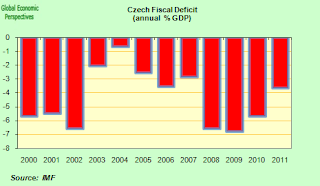 What is the justification for such a strong deficit in Europe’s fastest growing economy? Poland, the European Unionâ€™s largest eastern member, will post the 27-nation blocâ€™s fastest economic growth this year, driven by corporate investment,the European Commission forecast. Gross domestic product will grow 2.5 percent, with quarterly expansion of about 0.5 percent during the year, the EUâ€™s executive arm said in a statement today. 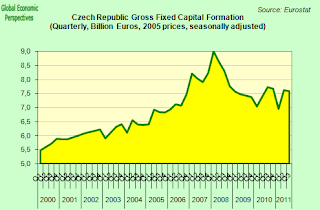 Spending on road and rail upgrades for the Euro 2012 soccer championship will help boost the pace of growth, it said. Well, let’s hope than that all this investment related to the championship will also be useful after the event (road and rail upgrades?). Anyway, economic developments afterwards will be interesting.